13 October 2014 |The familiar, shimmering apparition hovered above the room for a minute or two, then left, then reappeared for a bit longer before fading away. Nearly a decade after his death in 2006, Milton Friedman the man the Economist described as “the most influential economist of the second half of the 20th century … possibly of all of it was back at the University of Chicago, where hed built the reputation that won him the Nobel Prize for Economics in 1976 and established him as the patron saint of laissez-faire economics. 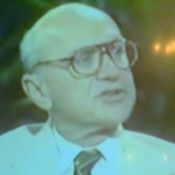 But unlike the free-market fundamentalists and Tea Party pontificators who often invoke his name, Friedman didn’t see the market as some all-knowing force that operates without governance, and he wasn’t opposed to environmental legislation. What he opposed was command-and-control regulation that dictated narrow solutions to complex and evolving challenges, and what he favored was something a bit more nuanced than the simplistic slogans spouted on Fox News. In his first appearance, Virtual Friedman offers his solution to one of the vexing problems of his day. Steve Cicala, who is an assistant professor at the U of C’s Harris School of Public Policy, then brings us into the logic of Friedman’s conclusion with a hypothetical. Lets pretend, he says, that he owns a steel mill that sells its product for $100 a ton. And let’s further pretend that co-panelist Michael Greenstone, who is the U of CÃs Milton Friedman Professor of Economics, lives downwind from his mill. Cicala is unequivocal on the morality of this situation:“I compensate every one of my other input suppliers, he says. “I have to buy the coal. I have to buy the steel. All of that exchange is based on mutually-beneficial, willing exchange, but theres no market for the pollution that Im inflicting on Michael. If he doesnt compensate Greenstone for damages and do so in a way that Greenstone agrees to then Cicala says he’s not a capitalist. Hes a criminal. Inglis, a rational Republican who was ousted by Tea Party insurgents in 2010, then asks the professors what they think to the anti-tax rhetoric thats become dogma in his own party specifically, he brings up Texas Governor Rick Perrys dismissal of a carbon tax because it would raise energy rates. Greenstone says the governor was probably correct, but that doesnt make him morally right because greenhouse gasses are “sprinkling around damages in Bangladesh, in Los Angeles, in Houston, and even in Austin, where Governor Perry works. And, unlike Cicalas factory, this isnt a hypothetical. “Those costs are real, he says “And theyre not being reflected in the price I pay when I fill my gas tank or turn on the light. So, yes, Perry is correct about the cost of energy at least in the short term, and to immediate consumers but hes morally wrong to resist an effort to pay for “these innocent parties who are minding their own business and having the climate change around them. Greenstone then reminds us that externalities aren’t part of radical, socialist ideology. “Its a core idea of economics, he says. “Its an apolitical idea. Why not Just Ban the Stuff? “What we need is an adjustment mechanism that will enable us to adapt to what happens as it develops, he says. “And of course, as everybody in this room knows, there is such a system namely the price mechanism which successfully steered us over several centuries from wood to coal to whale oil to petroleum to natural gas. That mechanism works better than command-and-control, he says, because it promotes solutions that we never could have predicted bureaucratically, and Greenstone wholeheartedly agrees. “The price system isn’t working in the energy system right now, exactly because carbon is priced at zero, he says. “Its going to be very hard for companies to raise money to come up with new energy innovations when theres no market for them. Then he reminds us again that this isn’t some crazy idea, for just as 98% of the 200 most often-cited climate scientists agree that climate-change is real, dangerous, and man-made (despite the best efforts of climate-science deniers to tell us otherwise), so do most economists endorse a price on carbon. “Its really remarkable the media always reports this near-consensus among scientists about the effect of human activity on climate change, says Greenstone. “What does not receive as much attention [is the] greater consensus, starting with Friedman and moving to the most left-wing economists that you can find, that the most correct public policy solution is to put a price on carbon. He may be overstating the consensus on a carbon price, although he later points out that all regulation has a price; it’s just than an explicit price on a specific pollutant is more targeted and efficient. Cicala agrees, and then offers the two most common methods for setting an explicit carbon price: one method is cap-and-trade, which puts a cap on the amount of emissions allowed and lest the price fluctuate. The other method starts with a price and lets that drive the amount. “For most economists, I think it would be uncontroversial that we should have a cap-and-trade system in which we define the quantity of carbon that can go into the air, he says. “Then, through trading, we’ll figure out..the least-cost way of [reducing emissions]. [Under such an approach], were not quite sure what the price is, but were certain about the quantity. The second approach the one that starts with a price essentially amounts to a tax, and it has the distinct advantage of sending a clear and possibly long-term price signal so companies know it’s worth their while to find climate solutions. “But the fear with the tax is that it will keep on going up,says Inglis. “If you start taxing at this price, then how high does it go? Greenstone concedes the point and proposes a price that starts with the “social cost of carbonWhile this doesnt really give the victims a say in the matter, it is a step towards justice. The problem is: how do you determine that price? “Theres emerging science around that,he says, citing research into the impact of plunges in crop yields and other results. “The US government actually has an official number, he says. $37 a ton. That would provide an excellent guidepost on how to set the tax and would be a way to constrain a mischievous congress from monkeying with it and making it go up or down to satisfy something political. Later in the discussion, he says that failing to embed the cost of environmental degradation in the cost of production amounts to a massive subsidy of nearly $240 billion annually for industry a number he arrives at by rounding US emissions off to 6 billion tons a year and multiplying by $40 per ton. “I dont think theres anything thats subsidized at that rate in the rest of the economy. While it all sounds great in theory, how do you implement such a set price? “If were the first to implement a tax, then carbon-intense pollution is just going to move overseas,says Cicala, floating the idea of “border adjustments” that “tax goods arriving at the US based on the carbon content. Inglis then says that, to him, a tax without a border adjustment is a no-go. He then opens an ideological can of worms by pointing out that the organization he now heads, the conservative Energy & Enterprise Initiative (which co-hosted last weeks event), believes any carbon tax should be “revenue-neutral”, which “means a dollar-for-dollar tax cut somewhere else. If we add a carbon tax, then we have to reduce another tax to keep government from getting too big, he says asking the others, with refreshing introspection, “Is that indicated by the economics or is that just my conservative philosophy coming to bear there? Here they flounder a bit talking about the chance to reduce “distortionary” taxes while ramping up a tax that corrects a market distortion, but not directly taking on the distortionary subsidies given to the oil sector. They manage to cover an incredible amount of territory in a very short period of time, but two glaring elements are missing from the discussion. One is implicit: you can tell from their other statements that these gentlemen abhor subsidies for the oil sector. The other, however, is one they only skirt: namely, what happens to the money if this is a tax especially if revenue neutrality is an “imperative”, as Inglis says? If revenue neutrality means you get to cut income taxes, doesn’t that defeat the purpose of charging a tax based on the social cost? After all, if the proceeds from that carbon tax just end up going to fund an income-tax cut, then where does that leave the victims of climate change? Greenstone does touch on this later in the discussion by alluding to energy transfers to the developing world, but the group never picks up the topic of offsetting, which is when the money raised under cap-and-trade goes directly to a reduction program elsewhere. I’m sure I’ll find some great stuff from both Cicola and Greenstone online, but it would have been great to explore this issue here. There’s also a weird digression where they talk about the importance of American leadership this on an issue where the US has been doing globally what the Republicans have been doing domestically: namely, gunking things up. You could also argue, as Greenstone implies, that the global “solutions” developed so far are flawed to the bone, but they don’t really address existing global measures or lessons to be learned from their failures. Despite this or maybe because of it the discussion around border adjustments actually gets quite fascinating, especially when Cicola brings up the idea of inviting a challenge at the World Trade Organization. Under his scenario, a US carbon tax on imported goods would be structured in such a way that it can be offset by an equal tax in the country of origin. And if those countries don’t implement a carbon tax on their own exported products? Towards the end, Inglis opens a thread that’s obviously near and dear to his heart: how to convince idealogues on the right that climate science is real and we need to deal with it. He provides two answers: one is to slowly build a tribe of rational conservatives who are now too afraid to raise their voices lest some pinhead from the Heartland Institute pillories them; the other is to begin with the end in mind namely, begin with the message that we can fix this mess without creating the kind of bloated bureaucracy that none of us really wants. Cicola and Greenstone warm to the first, but are leery of overselling the second point. While Greenstone does concede that the Obama administration’s current climate strategy is a mess, he points out that it’s a mess borne of necessity. Maybe, he says, now is a time for Republicans to offer a real plan based on a carbon price a plan that will be better than the mess necessitated in part by their own obstinacy. Both however, go out of their way to remind us that free-market fundamentalism isn’t a strategy. It’s a fantasy. While recognizing the cost of government inefficiency, Cicola reminds us that government is a necessary evil, especially given the threat at hand. “If were deciding between catastrophe for civilization and government inefficiency, Im willing to take a bit of government inefficiency for that trade-off,” he says. ← Will Last Month’s Climate Summit Stir Real Action on Climate Change?